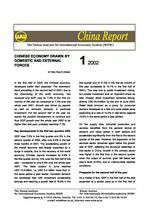 In the first half of 2002, the Chinese economy developed better than expected. The downward trend prevailing in the second half of 2001, due to the downswing of the world economy, has reversed and GDP rose by 7.8% in the first six months of the year as compared to 7.3% over the whole year 2001. Growth was driven by exports as well as domestic demand, in particular investment. For the second half of the year we expect the positive development to continue and thus GDP growth over the whole year 2002 to be higher than last year, probably reaching 7.7%.